Coco coir is the ideal “gateway” growing medium for soil growers keen to progress to hydroponics and bigger yields. Coco coir is made from the fibrous husks of coconuts. It is a natural, organic and renewable choice for your grow room. No wonder it’s so popular among today’s hobby hydroponic growers! Ask your grow store for advice. Don’t go cheap. When you open up your bag of coco coir inspect it closely. The vast majority should be ‘pith’—aka ‘coco dust’ or ‘coco peat’. 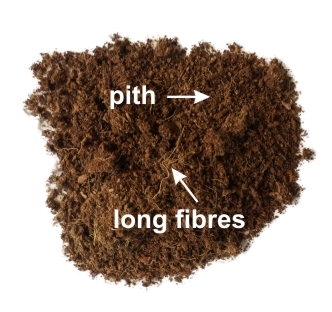 Pith is a highly absorbent, brown, powdery material with the appearance of loose-leaf tea. Pith alone is prone to over-saturation. That’s why you should also find some long fibres in the mix. These help to increase drainage and stop the mix from becoming too wet. You may also find some chips—hard crouton-like chunks—but these are not so common. 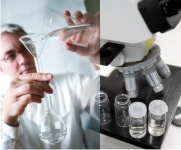 Coco chips help to create an even lighter, airier mix. The nuisance salt content of your coco coir is a good indicator of overall quality—the lower the better. Alas, quality varies considerably from one supplier to another. 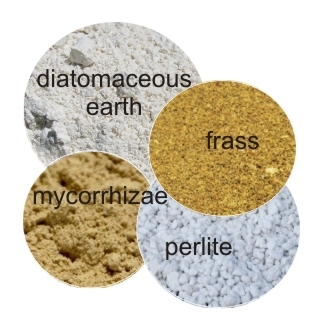 Tip: Savvy growers improve the performance of their coco coir with amendments such as perlite (for extra drainage), diatomaceous earth (boosts cell walls and pest resistance), insect frass (broad spectrum fertility with a hit of beneficial biology) and mycorrhizae (increases drought resistance and nutrient availability). Step 1. Pour two litres of warm, quality drinking water or distilled water into a large bowl. Step 2. Measure the EC (electrical conductivity) using a conductivity meter and make a note of it. Step 3. Add around a litre and a half of coco coir to the water. Step 4. Stir gently and leave for 15 minutes. Step 5. Strain the mixture using a sieve. Step 6. Measure the EC of the water again. If your conductivity meter reading is unchanged, you have exceptionally well-washed coco coir. If it’s increased more than 0.5mS (equivalent to 500µS or cF 5.0) you should consider washing your coco coir thoroughly before using it or choosing another brand.